PLEASE DO NOT RELY ON CALENDAR FOR AVAILABILITY! THIS IS A TIMESHARE RESORT. Marriott's owner calendar does not sync with VRBO. What is available can change several times a day. CHECK AVAILABILITY AND GIVE YOU AN ACCURATE QUOTE. Reserve up to 1 year in advance for preferred dates as many of the weeks sell out exactly 12 months in advance to the day. I only have weekly rentals. With Check in on Friday, Saturday, Sunday. OCEANFRONT 2 bedroom (sleeps up to 8) 3 bath, 1305 square foot suite with private lanai's at the luxurious, five star Marriott's Maui Ocean Club Resort. Located directly facing Ka'anapali Beach. Resort offers breathtaking sunsets and beautiful sand beaches. 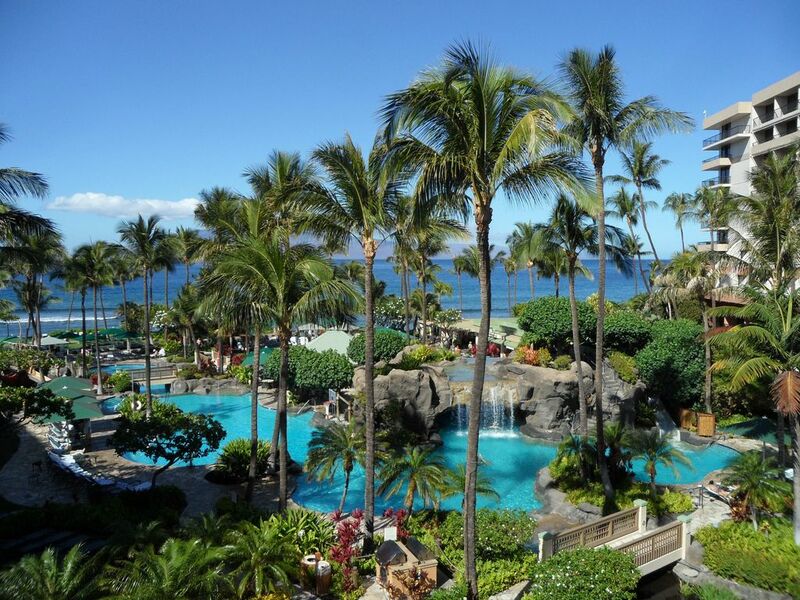 The resort is only minutes away from the resort area of Kapalua and the town of Lahaina. The resort features a large free form pool with waterfalls, two whirlpool spas, and water slides. The children's pool area includes its own water slide. Adjacent to the resort is the championship Ka'anapali Golf Course. Nearby golf includes the Kapalua Bay Course, Village Course, and Plantation Course. 2. Master Bedroom with king bed, color TV, desk with chair, sitting area, lanai, and separate bath. 3. 2nd bedroom with a king bed, queen sleeper sofa, color TV, small refrigerator, lanai, full bath. We have been to many beaches in many places. But Kaanapalli Beach has been our favorite since we first stepped foot here in 1999. We come here a few months every winter and never want to leave. There is always something going on, somewhere to go or something to do. The Marriott Maui Ocean Club is located directly on Kaanapalli Beach. From this location it is possible to never leave a 3 mile radius and still enjoy the town of Lahaina, endless tour operations, unlimited shopping options, malls, beach, restaurants & bars, grocery stores, golf,any type of rental you may need. We booked this 1 bedroom, 2 bath unit oceanfront. It was in the Molokai tower on the 5th floor. The views were stunning and it had a balcony off the master and one off the living room. We're a family of four with kids 4 and 7. It was the perfect room for us. The master included a chaise lounge which my 7 yr old slept on each night, while the 4 yr old loved the idea of sleeping in the "hideaway bed". The modest kitchen/bar was used a lot and they have grills by the pool you can cook on. The fridge is small. There's a coffee pot, dishwasher, plates, utensils, cups, mugs, tupperware... and a dining table. The resort is a kids dream come true. We stayed a week and it was the perfect amount of time. So many great activities for the kids, some cost extra but free ones too. Once a week they have movie night by the pool (sun) and a late night party (date night for the parents, $). The waterslide, pirate ship, waterfall/cave, basketball net, volleyball, jacuzzis, and full Starbucks retail store right in your backyard kept us busy most of the week. They offer free DVD rentals and have DVD players in the room. We plan to go again next year and will contact Kevin for booking! The beach was a too rough for us (waves) so we found a more calm beach in Napili. Aloha! Kevin was very helpful in matching our needs with one of his units. He communicated directly and honestly about the unit, the process and what we would find once at the Marriott. Check in was smooth and the well kept unit worked very well for our purposes. I would highly recommend Kevin and the Marriott. We thoroughly enjoyed our stay, from the pool and the beach to the beautiful, well-kept unit, to the complimentary classes offered (zumba, yoga, etc). Kaanapali is one of our favorite locations. Thank you, Kevin, for making arrangements and smoothing the way for a seamless, memorable vacation experience. First time and loved it. We really enjoyed our stay -- beautiful property and setting. Our family of 3 generations enjoyed our stay at the Marriott Timeshare with 2 bedrooms very much. It offered everything we were looking for and expected. The Marriott treated us well, the beds were comfortable and all accommodations were clean and updated. Great place for young children. The extra amenities such as a port a crib/high chair and rollaway beds for free were very appreciated. The activity booths were so kind to let us borrow left over sand toys so that we did not have to buy them. The pool area and restaurants were excellent we felt very comfortable on the grounds. Excellent Whalewatching! Very personable pool staff! Great rooms. Plenty of room and a fabulous pool. The rooms are clean! Great location-easy to walk to restaurants and shops. Short ride to Lahaina. Great beach walk along Kaanapali Beach. Lots of bars and restaurants along the Walk. Snorkeling or whale watching about 2 blocks away. Close to Old Lahaina Luau a must if you have not been to a Luau. Snorkeling at Honolua Bay just a short distance to the north. THE BOOKING CALENDAR AND RATES IS A GENERAL PRICING FOR A 1 BEDROOM 2 BATH Suite IN THE ORIGINAL towers WITH MOUNTAIN, OR GARDEN VIEW. THE PREMIUM VIEWS (OCEAN VIEW AND OCEAN FRONT) WILL BE QUOTED AT A HIGHER PRICE.